As South Africa holds a major conference on land rights, the BBC News Website looks at the case of a group of people who are still fighting for land 11 years after the end of apartheid. 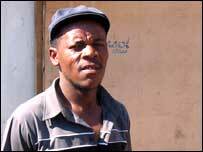 It is more than 15 years since Monwabisi Boco and his neighbours were evicted from white-owned farmland under South Africa's old apartheid laws. But the community of 400 families at Roodekop, on the edge of Greater Johannesburg's urban sprawl, still do not have land to call their own, despite the post-apartheid government's stated commitment to land reform. They are fighting a court case to prevent their eviction from a piece of unoccupied land that they were allocated only recently by the local council. The Roodekop community, formerly tenants on a nearby white-owned farm, were evicted from there in the late 1980s, and built tin shacks on a council-owned site next to a river. When heavy rain destroyed some of the shacks last year, local officials told the affected families they could move their dwellings onto an adjacent piece of land - apparently unaware that the land in question was privately owned. 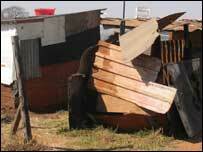 The landlord went to court to have the families evicted, and the case is still pending. Mr Boco feels the community is being unfairly targeted after moving onto the land in good faith: "We didn't take it by force, we spoke to the councillor. 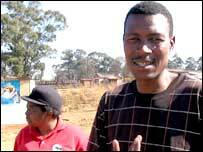 But the owner didn't open a case against the councillor, he opened it against us." Monwabisi Boco: "We didn't take land by force"
There are indications that Mr Boco and his neighbours were misled - whether deliberately or accidentally - by a council official who told them that the new piece of land had been purchased by the council on their behalf. Neville Chainee, head of housing for the Ekurhuleni Metropolitan Council, says that moving the shacks onto the privately-owned land was only intended as a temporary solution after people were made homeless by the floods. Close to the shack settlement, other land that was once vacant is blanketed with the tiny homes known as RDP houses, after the Reconstruction and Development Programme put in place after the 1994 elections. Some of the people who live there are tending gardens, or have added extensions to the basic starter units built by the government. The ANC government has identified the housing backlog as a policy priority, and has constructed 1.6 million new homes since it came to power. On several occasions, Mr Boco says, the Roodekop residents have been told by the council that they will be included in these new developments - but each time they have been passed over. Mr Chainee refutes suggestions that the Roodekop residents are being discriminated against: "We have a development programme that stretches 10 years ahead - people will become impatient, that's understandable, but people are not being passed over." One option being investigated by the government is draining the swamp area near the river to make it suitable for building. Mr Chainee sets out the difficulty faced by the government in providing land to those who need it: "We have limited resources, and we've got to comply with legislation. The state is not in possession of all land." 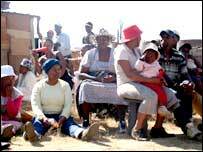 The Landless People's Movement (LPM), which has taken up the case of the Roodekop community, believes that the current legislation around land is preventing South Africa from moving beyond the patterns of land ownership established under apartheid, which left the black majority with access only to 13% of the land. At this week's summit, the LPM will be calling for an end to the property rights clause in the South African constitution. The organisation is in favour of a "social obligation" clause similar to the one in the Brazilian constitution, which allows for the expropriation of land that, for example, is not being productively used. The LPM also wants a change in the government's "willing buyer, willing seller" approach to land redistribution, which obliges the authorities to pay a market price for land acquired from private owners on behalf of a landless community. There are signs that a change in the law might have helped the Roodekop community out of their current state of limbo. "There were negotiations between the owner and the municipality over the price issue, but it came to nothing," says Simon Delaney, the lawyer representing the community. A legal representative for the family that owns the land said he did not want to comment while the case was before the court. But the law is not the only hurdle. Aloysius Masikane: "If I have land I can do something myself"
"There must also be political willingness and administrative capacity," Mr Delaney says. 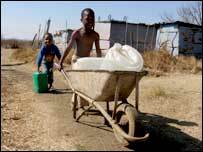 "In some places land has been allocated and pots of money are waiting to be used. It's not any fault of the constitution that the government has a backlog." In the case of the people of Roodekop, legal restrictions and administrative mistakes have combined to leave them in limbo. Although a farmer on another adjacent property has installed communal taps on their site, their temporary status has prevented the installation of electricity, sewerage and other amenities. Roodekop resident Aloysius Masikane says land, not housing, is the most urgent priority: "I cannot have a house without land, but if I have land I can do something myself."